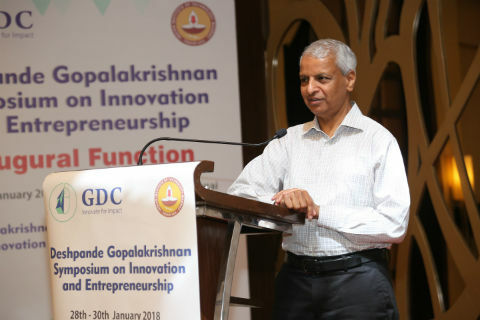 Chennai: In an endeavour towards linking academia to market place and create a process so that more and more faculty and students are willing to go through the entrepreneurship route, the first Deshpande-Gopalakrishnan Symposium on Innovation and Entrepreneurship was held at Indian Institute of Technology Madras (IIT Madras) between 28th and 30th January 2018. This symposium was organized by the Gopalakrishnan Deshpande Centre (GDC) for Innovation and Entrepreneurship at IIT Madras, with the support of IIT Bombay and the Deshpande Foundation. Established in 2017, the core objective of GDC is to foster innovation in academic campuses and bring about a transformation by which scientific and technological ideas can move from an institute’s laboratories to the marketplace by way of sustainable business ventures. The Symposium attracted like-minded practitioners, administrators, and academicians focused on promoting innovation and entrepreneurship across the academic environment besides early stage entrepreneurs and students looking to start their own ventures. The three-day symposium featured four keynote talks and five topical Panel discussions in an interactive forum, which were participated by eminent personalities from the academic and the industry including Mr. Gopichand Katragadda, Group CTO, TATA Sons Ltd, Mr. K. Subramanian, Executive Director – R&D, Powergear Ltd, Mr. S. Krishnan, IAS, Principal Secretary to Government, Housing and Urban Development Department, Government of Tamil Nadu, among others. 4. Funding Innovation across the spectrum – what do funders expect? 5. Innovation in Research methods – How to cultivate I&E thinking and Creativity in research scholars and Faculty? At the beginning of the Symposium, an MOU was signed between IIT Madras and the University of New Brunswick (UNB), Canada. The MoU between UNB and IIT Madras covers exchange of students of faculty for research collaboration & education purposes. Post-doctoral Fellows are also included in the scope, and will be prioritized. Throwing some light on the future course of action for GDC, Prof Krishnan Balasubramanian, Dean (ICSR), IIT Madras and Professor-in-Charge, GDC, said “Our first set of programmes will be launched in March 2018. This will be a pilot programme of about 5-6 teams, each comprising of a faculty member, entrepreneur and a mentor, who will interact with about 100 customers each to validate their customer value propositions and business models.” This exercise will aid in reducing the startup failure rate.